I Still Have Eleven More Days! I am really enjoying reading everybody’s year-end wrap ups, and I am totally going to write one of my own, because in spite of some difficulties, I’ve had a pretty epic year. But I can’t write it yet! I am super close to hitting a really cool mileage milestone and I don’t want to wrap up my year until I get there. The family Christmas run! This photo is from two years ago and my kids seem impossibly tiny, as compared to the gigantic men they have become in the last few months. Also, even though we’ve been doing a family run since at least 2009, and I know we take selfies to document said run, I can’t find any of the photos! Time to organize the hard drive. Years ago, when we started this tradition, UltraIronHubs and I had to run a little slower to make sure that the boys could keep up. Then Big Boy got faster than me, so it was three of us holding back for Little Boy. Then Little Boy got faster, and it was the three of them running slow for me. Now? This year? Both boys are faster than both parents! Hooray for an epic year! 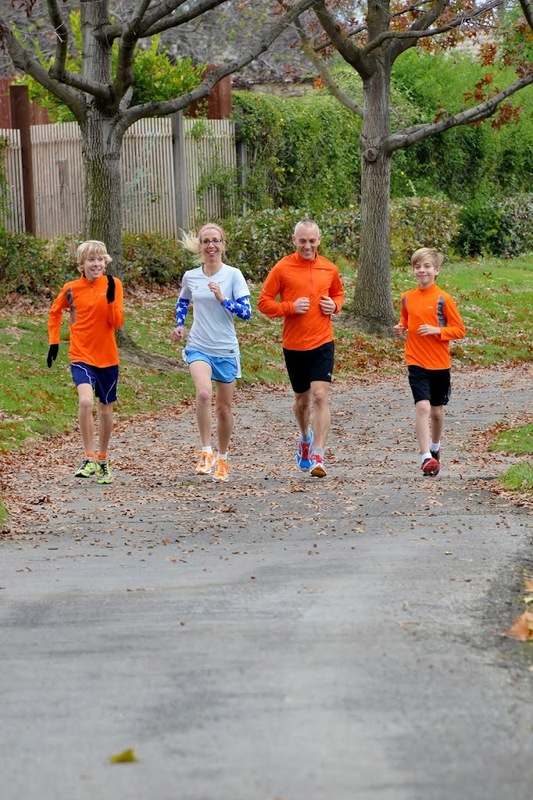 I love the tradition of a Christmas run….even if the boys are faster. Haha! Yay for the comment gods smiling on me today! I finally swapped out the default comments for Disqus. Only took me a year. Lol! So the comment gods should be smiling on us all from now on. 🙂 And thanks for always trying to comment, I appreciate it! My end of year recap won’t be posted til 2015. Because THEN this year will be over. 🙂 I’ve still got a race and fun to do! Love the idea of the family Christmas run. Wouldn’t be happening in this house. Isn’t it crazy how fast our kids grow? ?